Glymur is a waterfall in the East of Iceland and is the highest waterfall in Iceland. In approximately 40 minutes you can walk to the waterfall Glymur. The river Botnsá drops down over 198 meters and is fed by the 160 meter deep Hvalvatn (whale lake). The translation for Glymur is noise or tumult. Driving on road 47 at Hvalfjörður, don’t go through the tunnel, but follow the steep coast road until you come to Botnsá. The waterfall can be accessed from Botnsá, a small village of summerhouses named after the river. From the Botnsá parking area, one can hike up part of the mountain (350 m) on marked hiking paths; see here. The trail at the south side provides the best viewing point but is difficult and hazardous. From the parking area, both trails begin by passing through a gate and walking up a dirt road. The easier north side trail continues up the dirt road and is marked by rocks blazed with yellow paint. A few hundred meters up the road, the south side trail (also marked by yellow rocks) branches off to the right. This drops over a small cliff face and descends through a cave down to the river. In the summer there is a small pole over the river with an adjacent cable for a handhold, where travelers can cross to the southern side. After crossing the river, the south trail climbs steeply with various muddy, rocky and loose areas. At times it skirts steep dropoffs. About 3/4 way up this trail passes a small side waterfall with a sheltered pool. Hikers often stop here to refresh themselves; this point is a milestone only a short distance below the viewing area. Anyone attempting this trail should have proper boots, water, and preferably hiking poles though many people hike without poles. The south trail is a strenuous but non-technical climb rather than a mere walk. It is also possible to reach the base of the falls, but only by wading through the Botnsá. There are strong winds and serious risks of rockfall in the narrow canyon bottom. The name derives from a legend. A man violated the trust of a woman which belonged to the Huldufólk (“hidden people”) because he didn’t want to baptize their child. She was furious and turned him into a terrible whale, Rauðahofði. This whale killed many fishermen, including two brothers, whose blind father was a priest with magical powers. He placed the whale under a spell so he was forced to swim into the Hvalfjörður up on the river to Glymur. Under very much roar and protest (that is why the waterfall is called Glymur) the whale swum further and ended in Hvalvatn. It is said that whale bones are found in the lake. 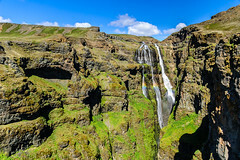 It is questionable whether Glymur is the highest waterfall in Iceland. In July 2011 the height of a waterfall near Morsárjökull was measured, part of the much larger Vatnajökull. This turns out to be about 240 meter high and is certainly much higher than Glymur. The name of this waterfall is not yet known, but the name Morsi is suggested. Since 2007 part of the waterfall can be seen from a distance, driving on the ring road at Skeiðarársandur towards Skaftafellsjökull. If the waterfall always existed, or that the retreating glacier is responsible for the new waterfall, is still being investigated.